No more suitcases. No more checking in to strange rooms. No more bland continental breakfasts. No more airport inspections, hectic plane and car rides. No more stream of people to meet, pose pictures with for the meantime. No more wondering what time it is in back Manila. No more impermanence (at least not in the pace that I had known for 73 days on tour). I am home. The sounds of my neighborhood, the smell of my room, the warmth of my family’s embrace, their crazy stories and laughter during meals, and the mostly quiet but other times loud yet always charmingly breathtaking presence of The Princess. I speak of course of my apo Ananda. She is 18 days old today. It’s great to be home and enjoying all these. Especially Ananda. Lolo’s pride and joy! The hearth of our home! But I also came home to schedules that needed to be finalized and stuff that needed to be attended to—contracts to sign, letters to write. I am also planning a new run of my creative workshop soon. And APO has to start going back to the studio and do our next album. And I MUST get back to the gym! I went through stuff I had lugged home and aside from pasalubongs and things I bought for myself, I saw a stack of plane boarding passes, calling cards, promo materials and other stuff which spoke of my brief life abroad. It was indeed a hectic tour. Super hectic in fact, but fun! And yes! I wouldn’t mind doing more of these! 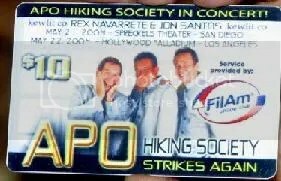 An APO phone card! It actually works, too! A future collector’s item? 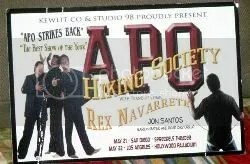 A nice souvenir flyer with Rex Navarette and Jon Santos. Another flyer they give away as reminders. By end of the month, I should get an indication if we are indeed going back to the US soon and/or do a 6 city Middle East-European tour this November! Hmm… It will be hard recovering from my last trip when I am already excited about the next one! Boarding passes. So many of them! Touring can be so addicting! Thanks to America’s wireless companies, not a few Filipinos can be seen waving their cell phones when we do songs such as When I Met You, or Batang-Bata Ka Pa, or Ewan! It’s probably because the phone companies offer unlimited calls during weekends and lots of Pinoys call friends during our concerts to share what they’re watching! Since leaving Manila, each member of the APO entourage has taken at least 15 plane rides until NYC. We still have Jacksonville and MacAllen in Texas! Then it’s back to Manila. If you sum up everything, it’s a minimum of 25 plane rides till we return home. Some of us exceeded that since we visited relatives and friends in between shows! Chances are, if you carry a Philippine passport you are bound to be “randomly selected” for full security screening. Eighty percent of the time, each of us was selected for complete body inspection. It means you are isolated from the line and ALL your bags and pockets and everything you have on you are thoroughly checked! Paul Simon’s song entitled Have A Good Time with the line “Paranoia strikes deep in the heartland” plays in my head! I am already a tired and weary traveler after three months of touring. In fact, I am so exhausted at times I have become forgetful. Upon arriving in Miami two weeks ago, I was so surprised to see so few clothes inside my maleta until I realized that I had left around 5 shirts, some boxer shorts and socks in Tampa. Must have been super sleepy that I did not bother to open the drawers where I left my clothes. Luckily, our producers had stayed behind and so I retrieved them two cities later. Today, we left Jacksonville, Florida at 4::30 AM to catch our 7AM plane for MacAllen. With hardly any sleep, I packed my bags confident that I had NOT left anything in my room. In the airport, I suddenly freaked out since I knew I had left behind a carton tube of posters. Ugh!!! I immediately called Ed Sevilla, our classmate and producer and he has forwarded it to me here in MacAllen. If you think that touring is a very glamorous endeavor, well…not always! We took FOUR airplane rides yesterday to get to MacAllen, Texas from Florida. We were either on a plane or an airport for almost 10 hours. I was suffering from a serious sleep deficit as I typed this last night. Luckily, I had good sleep last night and so was able to do a little shopping and some promo work. I will sleep tonight, and hopefully wake up refreshed tomorrow to meet more of our kababayans. Limang tulog nalang….and then I see ANANDA and my family! 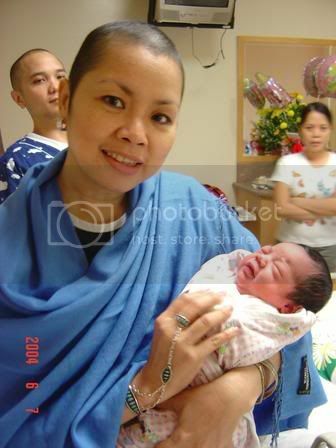 Today, June 7, 2004 at 12:30 AM, my daughter Erica, 25, for whom I wrote the song Batang-bata Ka Pa when she was born, delivered Ananda Aleisha into this world thus making me and Lydia grandparents!! Ha ha ha! Hee Hee Hee! Whooooooo!! Yipeee!!!! Heeeeeeeyaaaaaaaw! Doo doo doo, a-dah dah dah! Forgive my limited command of the English language right now but the right, smart lines to express this momentous occasion in our lives truly escape me as In write. I can’t tell you what a mind-blowing, earth shaking, paradigm shifting thing it is to have an apo. I AM A LOLO!!!! Listen, world! I wanna make sure you got that! Lola Lydia and Ananda. Behind them is dad Tristan and a visitor! When I talked to my wife awhile ago (she in Manila and I in Miami, I addressed her as Lola. It was the strangest yet the most wondrous thing to say! I actually felt the passing or crossing into a new era in our life together. The journey of our family, with Erica, Ala and Mio, and now Ananda continuous and now opens up into new passageways of adventures and yet-to-be-traveled paths of sharing and intimacy. Life’s mysteries and miracles continue to show up everywhere. God is still tinkering with our lives. And that’s just great–too great to put into words. Ananda, 7 pounds and 11 ounces, and by accounts of her mother Erica and her father Tristan is long, hairy and extremely cute. She seems to have taken after her Lola Lydia. And yes, she can scream her head off! Forgive me if I seem doting but I really can’t help it. I’ve been laughing and crying silly all day today. I promise to forgive you too, when your turn comes. Martin Luther King once said that a baby born is God’s way of saying that LIFE must go on! What a mysteriously eloquent, wonderful, loving God it is that decides to send us messages through such incoherent beings who cannot yet talk but know how to elicit unconditional love from us. You can cry all you want, Ananda, and complain when you’re hungry, and keep everyone awake and make all these demands that babies make. As far as this Lolo is concerned, you are his little angel! Tonight, APO sang Batang-bata Ka Pa and I mentioned to our Miami crowd that you, Ananda were born today to wild applause. Welcome to this world. I promise to make it better for you! Pictures to follow soon, dear reader! Had a brief respite from the tour after our wild LA show. I visited my sister Lory in Oxnard, a quiet place by the beach. I enjoyed some Thai food, great company and some needed moments of solitude where I just walked by the beach or just stayed home. That was quite refreshing. While my sister Lory and husband Greg were out, I looked at pictures around the house and saw some of my mom and dad which I had not seem in a while. 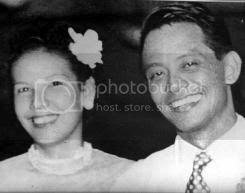 My father died at age 42 in a plane crash with President Magsaysay back in 1957 and my mom passed away around 4 years ago. I took digitals of them and will put them in my own house, too. 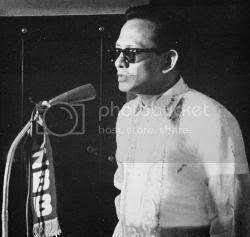 My pogi dad who had his own radio show then! Ester and Jess as young newly weds. I also took the time to go to a Mac store and ask all the questions I wanted answers to regarding my new 3rd generation 20 gig IPOD. I just love this toy. APO’s Reno leg of the tour was something else. When we landed, we saw a big billboard of us at the airport. 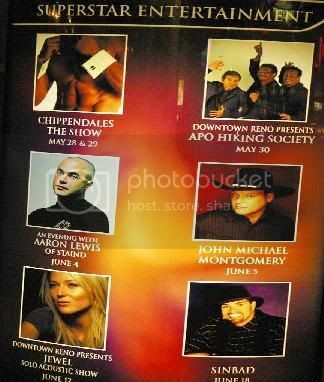 Inside the three biggest casinos there (El Dorado, Circus Circus and Silver Legacy) there were posters, video kiosks, flyers, newspapers, magazines which featured us together with Jewel, Sinbad, and Chippendales! (That was a laugh!). The Reno concert went really well for us and for the full house of 3,000 people who watched and gave us an ovation. Gratifying, to say the least!! It’s what we entertainers live for! Meanwhile, I am back on the hustings here in Tampa visiting ticket outlets and shooting the breeze with our kababayans as we promote the show. We have two this weekend, one in Tampa and the other in Miami. Will know by tomorrow if they will increase it to two shows in Tampa.